As my first year at Santa Fe University of Art and Design wraps up, during which I had the honor of serving as faculty advisor to the Creative Writing and Literature Department’s student literary journal, I’m delighted to share the newly minted 2016 issue of Glyph, published by Santa Fe University Press. 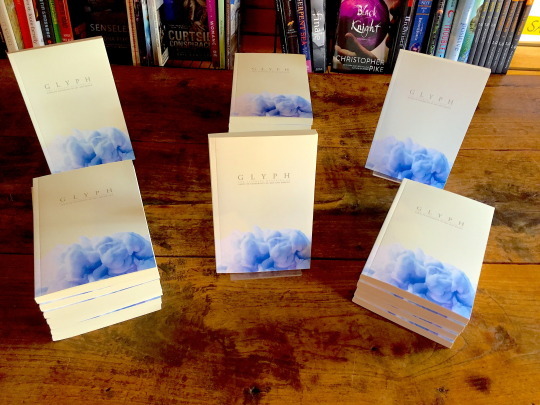 Released this week with our Glyph Gala on Tuesday night and a contributor reading last night at Collected Works in downtown Santa Fe, the issue is beautifully designed and full of excellent student poetry, fiction and non-fiction. The team of five student editors and graphic designer were a pleasure to work with this year, and I’m very proud of their work and dedication. It’s been a great first year, and happy summer to all!